It seems like every couple of years there is some new disease everyone is sure will spread around the world and kill us all. Thankfully, modern medicine ensures things like that don’t happen (so far), but what would it take for some super virus or bacteria to really wipe out mankind? That is exactly what Plague Inc. Evolved lets you explore. You design your own super disease to try to kill every human on Earth. It sounds morbid and evil because it is, but it also makes for a surprisingly fun videogame. 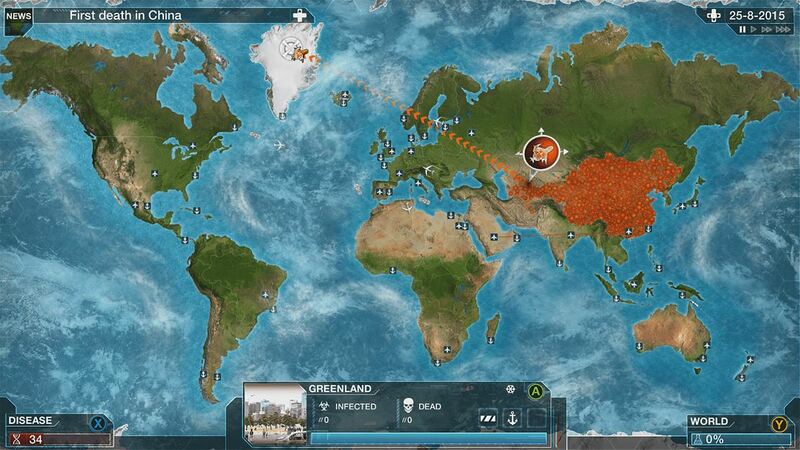 See our full Plague Inc. Evolved review here. Originally released as a free to play mobile game full of in-app-purchases and paid add-ons, Plague Inc. Evolved comes to consoles with a $15 price tag and no microtransactions in sight. $15 might be slightly steep just to avoid the obnoxious ads and IAP of the mobile versions, but we’re okay with it. If it seems too expensive, the game seems to go on sale on Xbox One pretty regularly, so pick it up then. The gameplay in Plague Inc. is dead simple as it is entirely menu driven. You first choose what type of disease – bacteria, virus, zombies, mind control, etc. – and then decide where in the world it will start. You typically want to start your virus in an area with sub-par healthcare, but that is also well connected to other parts of the world so it will spread quickly. 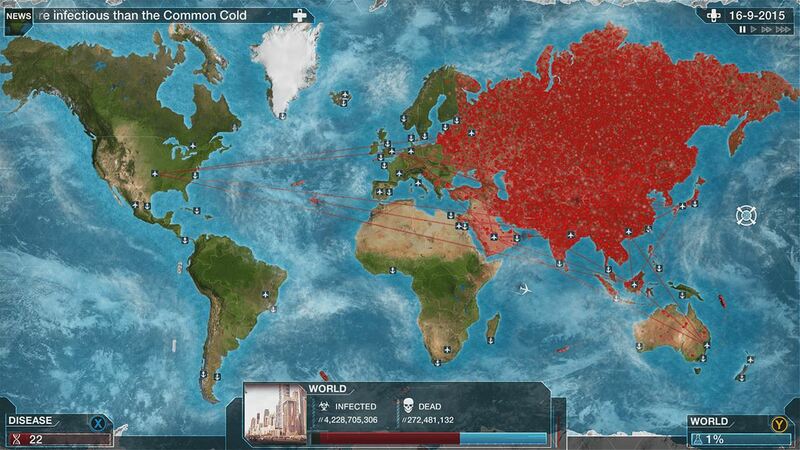 Then you unleash it on the world and sit back and watch as the world map slowly turns red as the disease spreads. As your creation spreads you earn DNA points that you can spend to mutate the disease to change it. You can make it spread through the air, or through water, or through animals, as well as make it more resistant to drugs and treatments. You can also change the symptoms of the illness, such as making the infected cough or sneeze or vomit, as well as more insidious things like causing paranoia and making people go crazy as they get sicker (which makes them spread the illness to other people). While your virus spreads, doctors are also trying to figure out a cure. The idea behind the game is to kill everyone in the world before the cure stops you. You have to find a balance, though, between making the illness spread quickly while also being deadly, but not so deadly people die before they can spread it. It is a fun balancing act that requires you to put some actual thought into each new mutation. The controls work very well on Xbox One as well. The mobile version just had you touching the screen to collect DNA points and navigate the world map, but on Xbox your cursor automatically snaps to nearby interactive bubbles that makes it extremely easy and fast paced to play. The game is also fairly intuitive as the various options and mutations should make sense to anyone that has taken high school biology. Presentation is very simple as you’re mostly just looking at a world map the entire time, but everything is nice and clear and easy to see, so no complaints here. All in all, Plague Inc. Evolved is a surprisingly fun and addictive game to play despite the dark nature of its core concept. Making a new disease called “Fluffy Kittens” or “Free T-Shirts” or something and wiping out mankind is silly and funny. You do feel kind of dirty and gross when some new disease is particularly effective, though, and watching the counter of living humans tick down as everyone dies is pretty morbid. Good thing it’s just a video game, then, right? The different types of starting diseases, plus the different ways you can mutate them, means there is a ton of replay value here as only a few changes can result in a totally unique result each time you play. Just starting the infection in a different part of the world makes a huge, huge difference. We really like Plague Inc. Evolved overall and easily recommend it for a purchase.